Ms. Jessica Weislogel is currently a 3rd Degree Senior Black Belt. 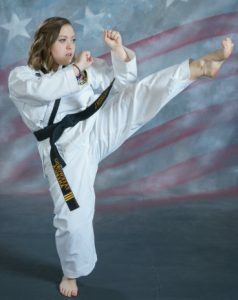 She began studying taekwondo in the Spring of 2005 under Mr. David Weislogel and Ms. Mel Thompson at Hilliard Taekwondo. Ms. Weislogel started helping with classes in the leadership program at both Hilliard Taekwondo and Village Taekwondo in 2008. She became a certified instructor in 2011 and became a Level 4 Certified Instructor in Taekwondo America in May of 2018. She teaches classes 2-3 days a week at Village Taekwondo. In addition to Taekwondo, Ms. Weislogel is very active in community theater and is currently attending Columbus State Community College.